PT. SUPRANUSA INDOGITA is a leading manufacturer and the biggest exporter of rubber products to its clients worldwide. We are the sole manufacturer of SUPRANUSA RUBBER, your reliable partner in manufacturing high quality rubber products. We produce durable products proven as worthy investment. We specialise in rubber matting, we manufacture and provide solutions for flooring and matting needs for both directly to consumers and suppliers. Located in Sidoarjo - Indonesia, PT. Supranusa Indogita is an ISO 9001:2015 certified company. Our productions also adheres to stipulations set out in regards to human and environmental safety complying with REACH, a standard created by European Chemicals Agency and passed DLG Test Center in Germany. With the support from our expert team in rubber industry field: Export-Import, Research and Development, Laboratory and Quality Control, we are focused on delivering consistency and the highest level of quality possible. PT. 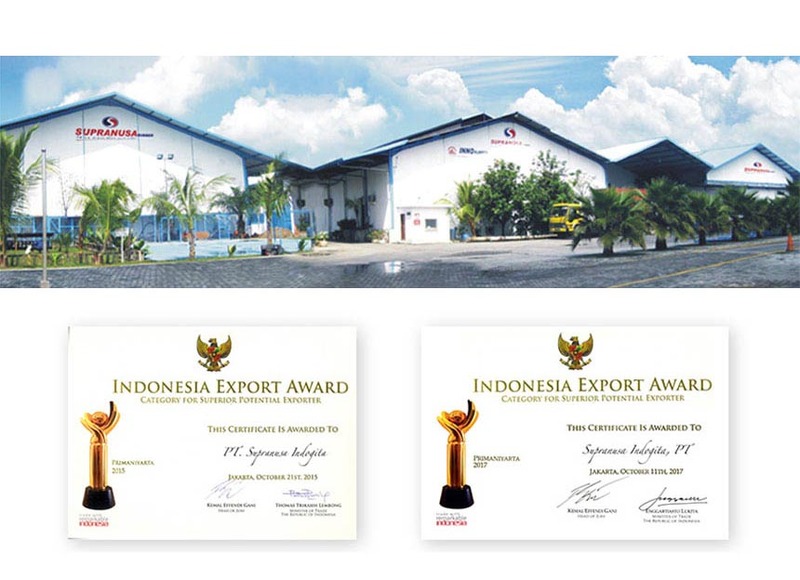 Supranusa Indogita was honored to receive the coveted Primaniyarta Award, the greatest reward awarded by the Government of the Republic of Indonesia to the most successful Indonesian exporters and to those who can be the role model for the other Indonesian exporters. To be respected as world manufacturer, focus on quality control, research & development, for innovative quality products, aiming for total customer satisfaction. PT. SUPRANUSA INDOGITA is a leading manufacturer and the biggest exporter of rubber products to its clients worldwide. We are the sole mmanufacturer of SUPRANUSA RUBBER, your reliable partner in manufacturing high quality rubber products. We produce durable products proven as worthy investment. We specialise in rubber matting, we manufacture and provide solutions for flooring and matting needs for both directly to consumers and suppliers. Located in Sidoarjo - Indonesia, PT. Supranusa Indogita is an ISO 9001:2015 certified company. Our productions also adheres to stipulations set out in regards to human and environmental safety complying with REACH, a standard created by European Chemicals Agency and passed DLG Test Center in Germany. With the support from our expert team in rubber industry field: Export-Import, Research and Development, Laboratory and Quality Control, we are focued on delivering consistency and the highest level of quality possible. Rubber is our complete attention. SUPRANUSA RUBBER is a name that you can trust in manufacturing a wide variety of high quality rubber products, safety, comfort, and durability. Research & Development team is continuously seeks innovation, improvement, development of its products and procedures. In-factory of testing laboratory, with the latest technology and testing machines to comply with American Standard Test Method approach. SUPRANUSA is an ISO 9001:2015 certified company and our products passed the test by TÜV Rheinland for REACH test and DLG Test Germany. Large production capacity up to 100 tonnes per day to fulfill market demand. Customized sizes for different applications and Jumbo sizes are also available with various sizes and profile designs to suit customer’s needs. For years now, Supranusa Rubber has built up a solid reputation in rubber manufacturing with many partners around the globe. With our extensive experience in producing high quality products, customer satisfaction is guaranteed. We warmly welcome any inquiries from around the world to have the opportunity to build a long term business cooperation with us.